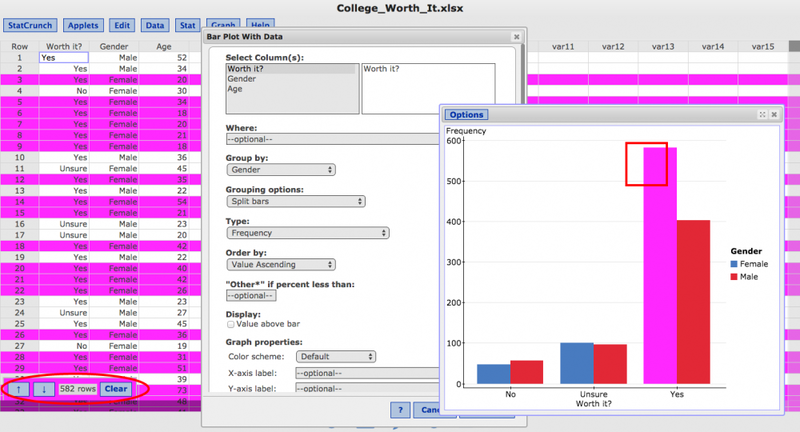 StatCrunch is a Web-based statistical software package for analyzing data. StatCrunch works on any desktop browser, such as Chrome, Firefox, Internet Explorer or Safari. StatCrunch also works with Web browsers on smartphones or tablets running iOS, Android and other mobile operating systems. This tutorial is a quick introduction to what StatCrunch can do, including loading data, calculating basic summary statistics, constructing simple graphs, interacting with those graphs, and copying StatCrunch results into other applications. For a shorter tutorial using saved data, see Getting started with StatCrunch (short version). 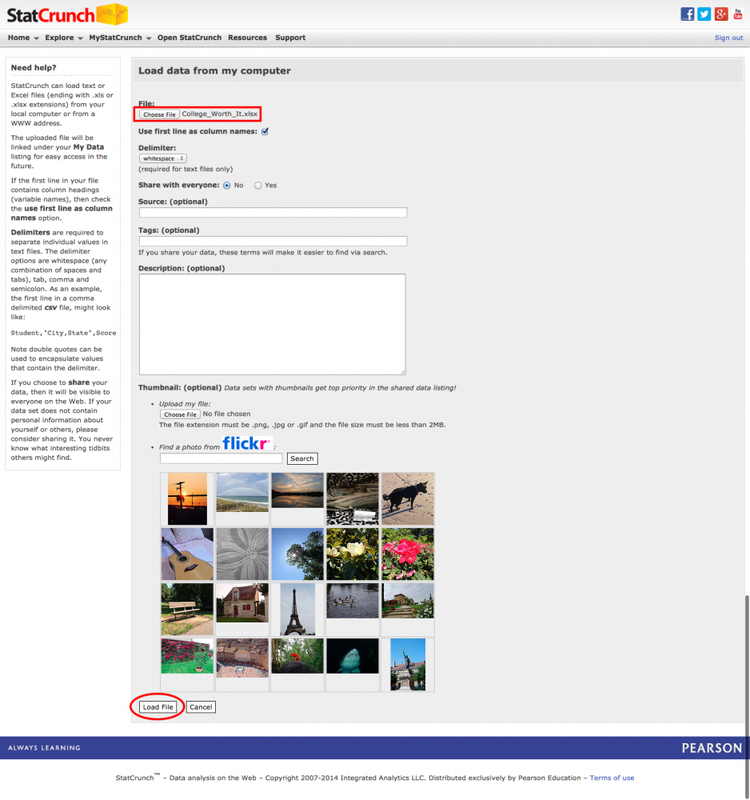 After signing in to www.statcrunch.com, you will be directed to your My StatCrunch page as shown below. 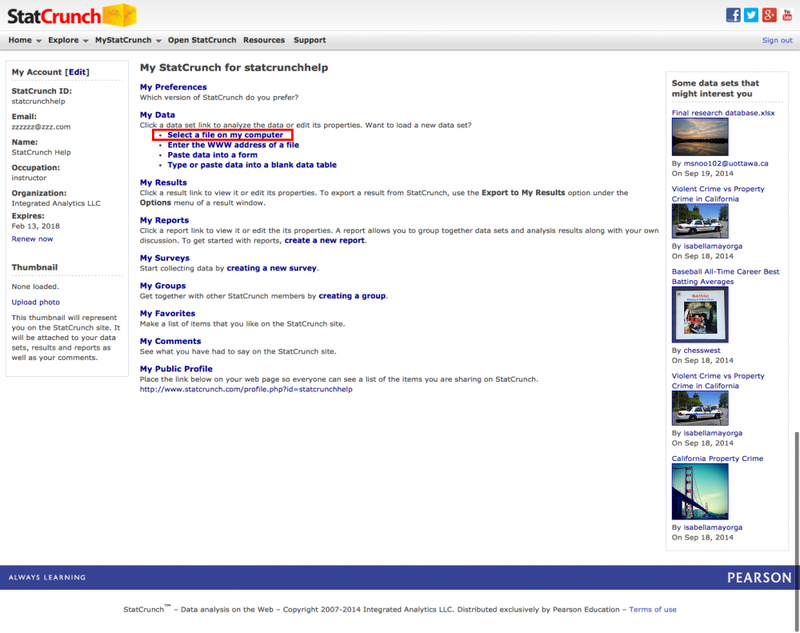 You can also navigate to this page by clicking on the My StatCrunch link at the top of every statcrunch.com page. This page contains a listing of all the items you have created and saved on the statcrunch.com site. My Data shows a listing of your saved data sets. My Results shows a listing of results that you have generated and saved using the software. There are also listings available for the reports, groups, and surveys that you have created. Under My Data, there is an option for loading a file from your local computer into StatCrunch. There are also links for loading a file from an Internet location, directly entering data into an empty StatCrunch data table or pasting data into the software. For this example, choose Select a file on my computer. The options for uploading a data file are then shown below. StatCrunch can read text files (.csv, .txt, etc...) and Microsoft Excel files (.xls and .xlsx). Select the Choose File button and navigate to the file on your computer that you wish to load into StatCrunch. 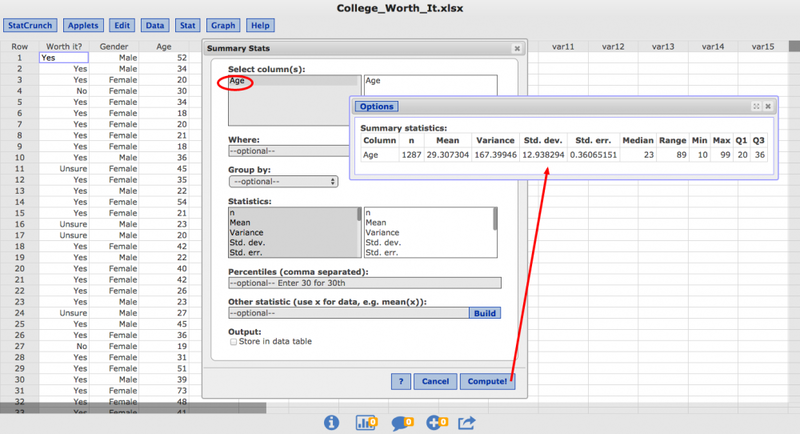 In this example, the College_Worth_It.xlsx file (available here) has been selected below. This particular data set contains information collected from a survey conducted at statcrunch.com. Respondents to the survey were asked if college was worth the cost with the possible answers being Yes, No or Unsure. Respondents also provided their Gender and Age. The first line in this data file contains column headings so there is no need to turn off the Use first line as column names option. Since this is an Excel file, there is also no need to specify a Delimiter, but this input would be required for a text file. There are also options for sharing the data set with others and for including additional information about the data set. Click on the Load File button, and the data set will be uploaded to statcrunch.com for analysis. The data set will also be stored under your My Data listing for future access. The Stat menu contains a number of procedures for summary statistics, tabulation, hypothesis testing, confidence intervals, regression and much more. With this data set, consider the task of computing summary statistics such as the mean and median ages of the respondents. To accomplish this task, select the Stats > Summary Stats > Columns menu option. In the resulting dialog window, select the Age column and click Compute! to generate the table of summary statistics shown below. The mean age of respondents is shown to be roughly 29.31, and the median age of the respondents is much lower at a value of 23. 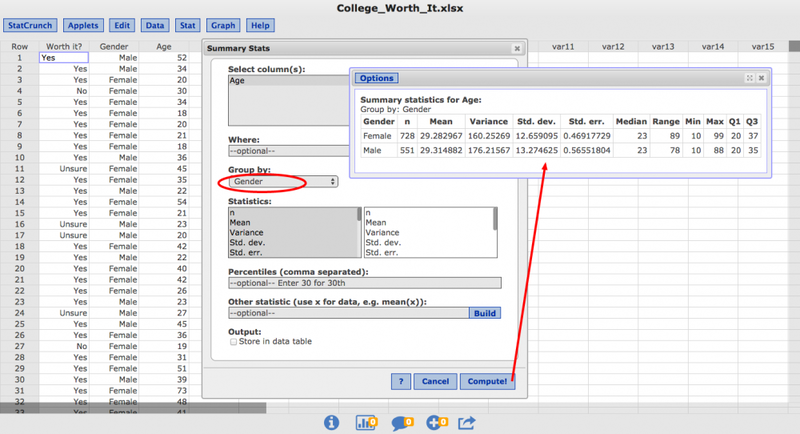 To compute separate summary statistics for each value of Gender, choose Edit under the Options menu of the summary statistics output window. In the dialog window, specify Gender under the Group by option. Click on Compute! to generate the table of summary statistics shown below summarizing the ages of respondents of each gender. The mean age of female respondents and the mean age of male respondents are both very close to 29.3. The median ages of both genders are exactly 23. For a more thorough tutorial on calculating summary statistics, see Computing summary statistics for columns. 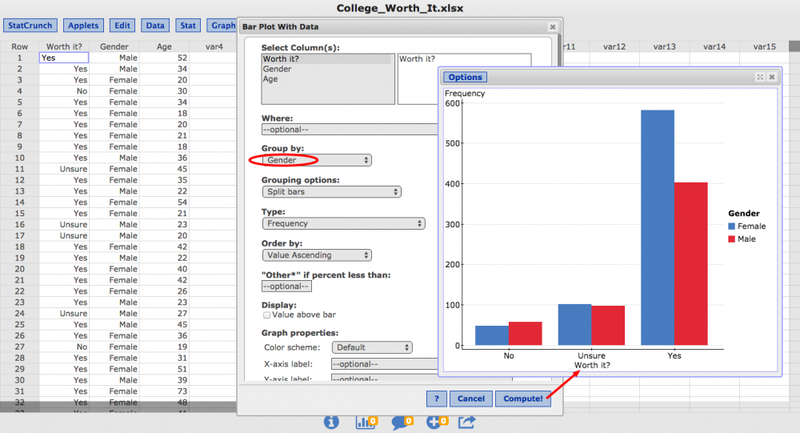 The Graph menu contains a number of options for displaying data in a variety of formats. To summarize how respondents felt about college being worth the cost, choose the Graph > Bar Plot > With Data menu option. Choose the Worth it? column, and click Compute! to generate the bar plot shown below. In this case, this plot indicates that the overwhelming majority of respondents said that college was indeed worth the cost. For a more thorough tutorial on creating a bar plot, see Creating simple bar plots with raw data. 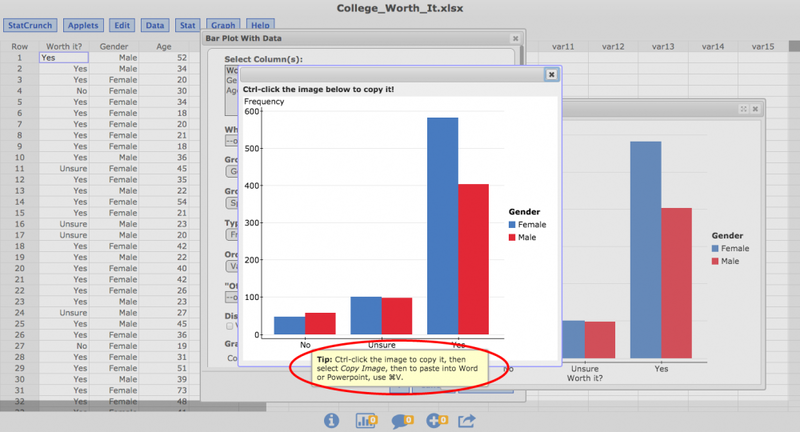 To break out these responses by Gender, choose Edit under the Options menu of the bar plot window to reopen the dialog window. Select Gender as the Group By column and again hit Compute!. The split bar plot shown below splits the original responses color coded by Gender. Note the majority of those who answered Yes were Female. For a more thorough tutorial on creating bar plots with grouped data, see Creating split and stacked bar plots. Most graphics in StatCrunch are interactive. This can be a very powerful feature. For example, to identify the females who said college was worth it, click and drag the mouse to form a rectangle which overlaps the appropriate bar as shown below. The selected data values are then highlighted in the graph, and will also be highlighted in any other graphs that are produced. The rows corresponding to the selected values are highlighted in the data table as well. Clicking the ↓ or ↑ buttons in the lower left corner of the window will scroll the data table to show the next or previous selected row. This is especially useful when a small number of rows have been selected in a large data table. Adjacent to these two arrow buttons, the value of 582 rows indicates how many rows have been selected. Turn off the highlighting by clicking on the Clear button in the lower left corner of the screen. Both tabular and graphical results can be saved to your My Results listing at statcrunch.com, or they can be copied, printed or downloaded. 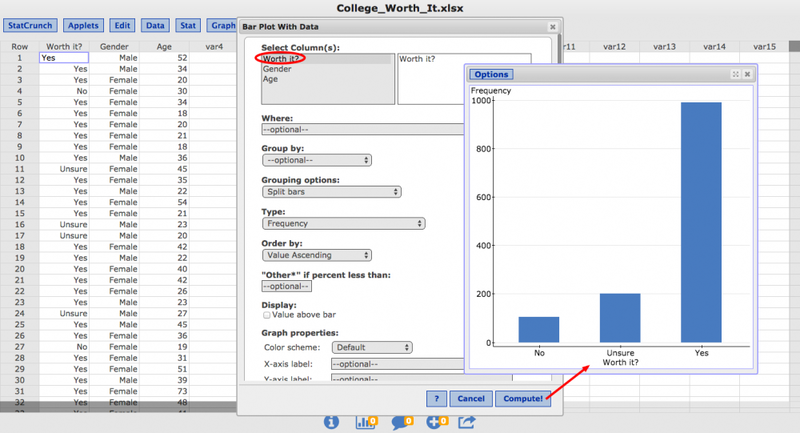 To copy the above bar plot, choose Copy under the Options menu of the bar plot window as shown below. To finish copying the image, follow the Tip provided for your platform as shown below. After the image is copied, it can be pasted into other applications such as Microsoft Word or PowerPoint. 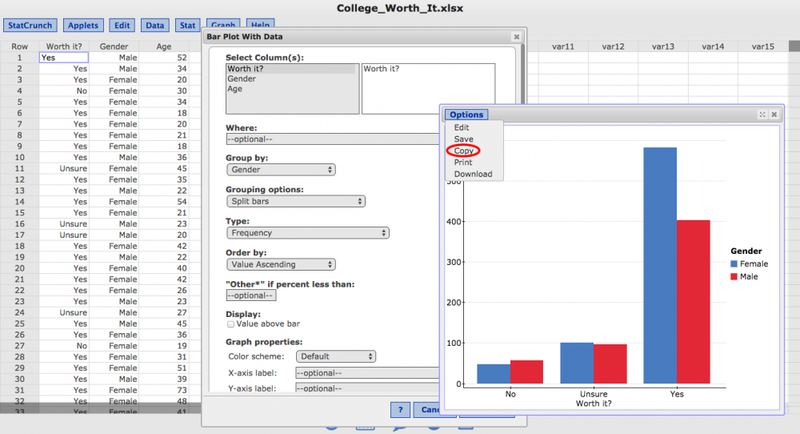 Saving, printing, and downloading are also available under the Options menu of the bar plot window. Copying tabular results is even simpler. To copy tabular results, click in the results window and use the standard keys on that platform to copy the selection, and then use the standard paste keys to paste the results into an application such as Microsoft Word.